Hello people, I’m back to my little blog! I haven’t talked about Karatbars for a long long time either. Meanwhile some new things were introduced. I’ll go over them so that you are aware. As well as some other stuff that I didn’t cover before. I feel like starting with Harald Seiz. He wrote a book! If you remember, he is founder of the company. 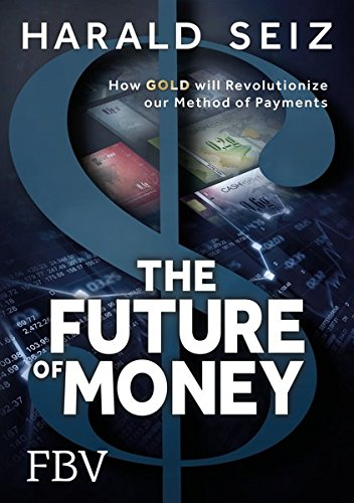 The title is The future of money: How gold will revolutionize our payment system. The German version is already available. The English one won’t be ready until September due to time needed for the decent translation. However, you can pre-order now. Never before in times of peace has the subject of money evoked the uncertainty it does today. Although, we live in affluence here in Germany, many people begin to ask themselves whether the value of our money is dwindling away. Cash seems permanently under attack as the media bombards us with theories on the ‘End of Cash’. “Affluence” means abundance/wealth, in case you don’t know (maybe it’s just me). Harald Seiz is coming from insurance and property industry. He also worked as an independent financial adviser for a couple German firms. So, the guy knows what he is talking about. And in general, he is quite big on goals in terms of how far he wants to take Karatbars. I talked about this peculiar-looking Karatbars cash gold a little bit less than a year ago. At that time only 0.1 gram note was available. Now, since October of 2016, more denominations are available: 0.2 gram, 0.4 gram, and 0.6 gram. These cards look like your regular currency cash. Except with a gold bar embedded in them. All gold is 999,9 obviously. Karatbars doesn’t deal with purity less than that. This one I should’ve brought up earlier. It has been around for a while. If you own a company and don’t mind or even prefer to be paid in gold, than this is for you. You can register your company with K-Exchange and get paid for your goods or services in Karatbars gold! You company can be either brick-and-mortar or online, doesn’t matter. As long as it is legal. It’s free to register. And before I forget, through K-Exchange you can also receive payments via KaratPay. What is KaratPay? Paying with carrots..! No, not even funny (wouldn’t be bad though, then a genetically modified version of a carrot would be created right away, you know, to increase crop yields 🙂 ). If being serious, than KaratPay is an online transaction platform. Something like PayPal. Of course the “currency” is gold. Anyone can create an account, for no free. Obviously, you have to become a Karatbars affiliate first (remember, you can choose a free option). You load it via Karatbars MasterCard. This way, without getting off your chair, you can pay for goods and services, transfer payments to other affiliates, receive payments. In gold. The URL for KaratPay is https://pay.karatpay.net. There are a few other very similar URLs, so don’t mix things up. Karatbars videos (including tutorials) are now all neatly organized on Karatbars Youtube Channel. Organized by playlists. You can subscribe to any of the lists to get notified whenever new stuff is added. For those who want to eternalize the growing up of their little human. See here. That’s if you need something that nobody else would have. You send your ideas and fantasies. And they carve you a card with a piece of gold just the way you want. Rhymes! A unique gift by the way. Seems like I covered pretty much everything worth knowing.